I had set my phone to alarm at 8:15 for our complimentary breakfast at 9. I got up when it went off and got in the shower. I couldn’t figure out how to work it, at least, how to get hot water to come out. It turned itself off eventually, which I figured meant my shower time was over. I told Andy not to even try when he got up at 8:30 and we packed up. Then I realized I couldn’t find my passport, which I had been keeping in my pocket. I was very stressed out. The last time I knew I had it for sure was the rental car desk. Andy and I talked over our options before and during breakfast. It could be in Wicklow, Pirate’s Cove, The Gallyvoe Beach, or the Gallyvoe Hotel. We figured we could try calling these places and then the American Embassy if that didn’t work. I was too stressed out to eat much of my full Irish breakfast, which involved a lot of meat anyway. I nibbled at the egg and bread and waffle-looking potato patty. So we got through it and talked to the hostess. She told us a few things about Cobh, which we were about to visit and gave us a B&B brochure. When I told her about my passport, she offered to call the hotel. She did and they had it! We were saved. We drove down to the hotel (for the third time) and retrieved it from their reception. With a great sense of relief on my part, we were off to Cork and Cobh (pronounced Cove)! 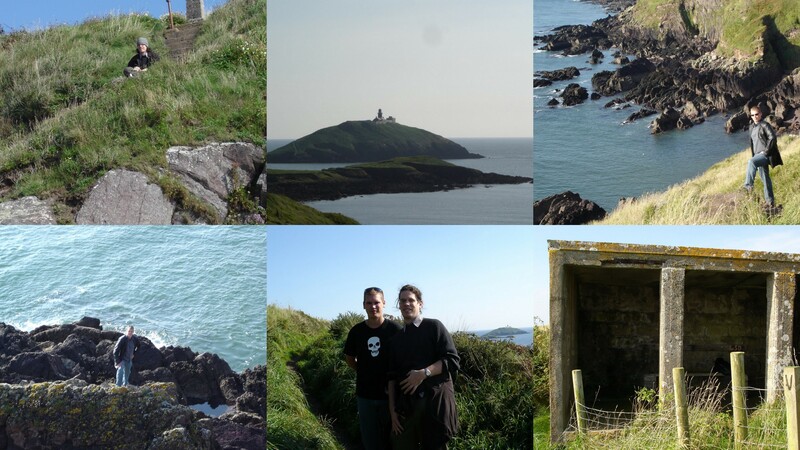 But first, we stopped in Ballycotton, a town on the far southern coast with a cliff walk. This was a beautiful stroll along the cliffs and our first in Ireland. I wanted to hurry and get to the city but Andy admonished me that it was all about the cliffs and castles. So, we did the cliff walk and it was excellent. We parked next to the local pitch-and-putt and started out. We were pretty high up, but at one point there were stairs down to the sea that Andy took, but I stayed at the top. We took pictures of each other in our respective positions. We saw a bunker maybe three quarters of a mile further down the cliff and decided to end our walk there. It was pretty cool and had lots of interesting graffiti in it. On our way back to the car, we passed a lot of morning joggers. Andy asked me if I lived here if I would do the walk every day. Like a true party pooper, I told him I probably only would if the other end of the walk was where I worked. It really was beautiful, though. Highlights from our first cliff walk. We took the coastal road back to the main highway that goes to Cork and Cobh. 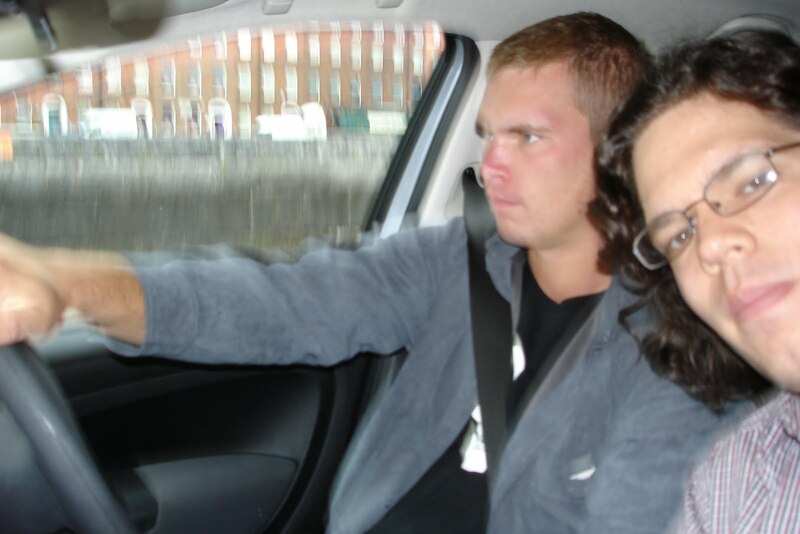 I was getting agitated because we hadn’t paid our toll from Dublin the day before and we had to do it by 8pm. So, we decided to stop in a town called Midleton. We went to the supermarket, since that’s foten where you can do it, but the clerk had no idea what we were talking about. A very nice local customer pointed us to where we could do in town at a convenience store type place. Paid up! We then headed out of town the wrong way, drove for 10 minutes, turned around and came back so that we could leave the right way. We were on our way to Cobh, which is an island with only bridge to get on and off of it. We followed the signs to the small harbor town and drove through FOTA, a wildlife preserve along the way. We came into town in kind of an unexpected place and parked on the promenade, which is a waterfront area on the other side of the harbor from the city centre. We walked through the harbor past the giant cruise ship boat ties to the tourist areas. This was apparently the point from which most of the Irish left during the famine to come to the US via Ellis Island. 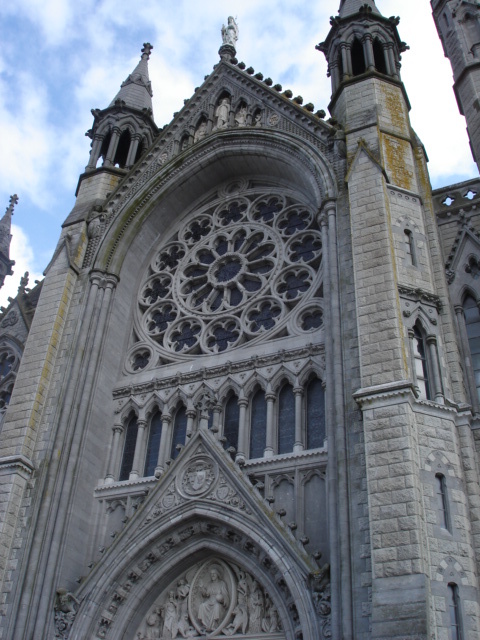 We walked up a steep hill to the Cobh Cathedral, a giant gothic thing. We walked in and all around it and then came back down the hill. On the way down we saw some “toughs” who I thought were looking for trouble but Andy said they were just kids. We stopped for some paninis. Folks, in Ireland apparently they call barbecue sauce “cajun sauce.” I ordered cajun sauce on my panini and it was a mistake. They did give us a nice salad, though, and some potato chips. We walked back to the car and decided to drive out a different way than we came in, thinking we might see something neat or maybe stop at the graveyard. We got a little lost and ended up driving all over on the very hilly and very narrow streets of the town. We even drove right past the Cathedral again. We made it out the other entrance to town and looped back around the other side of the island to the same one bridge we came in on. 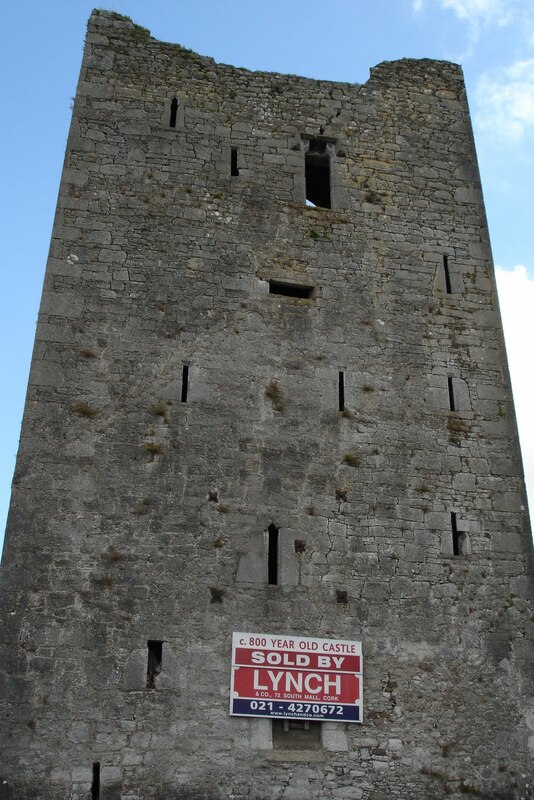 We stopped just before the bridge to check out a castle that was for sale on the side of the road. After making an appraisal, we drove back across the bridge through FOTA and were out of there. Next stop was a castle that had been restored to as it was in the 1600s. This one was run by the Irish government and we were not charged a fee. This might be because it’s free or it might be because we were entering the tour late. We learned all about Lord Barry and Lady Roche and their marriage. 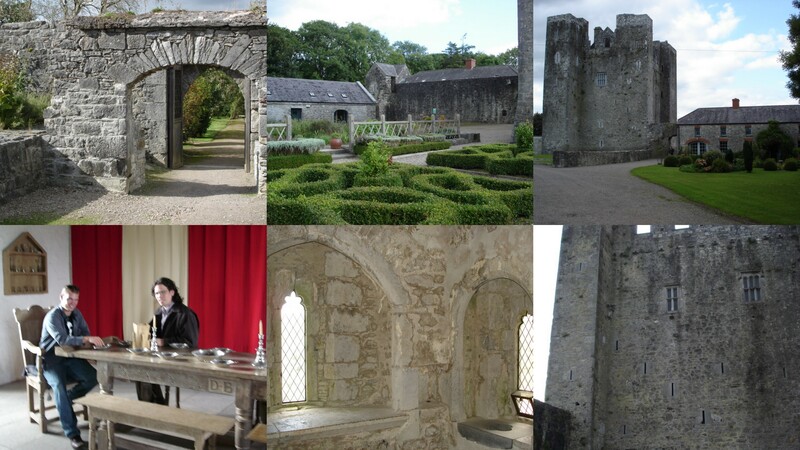 The castle was restored to as it was during the time that they lived there. I would definitely recommend this site immensely. Out tour guide was very good and took our picture eating at the Lord’s table. So, cliffs and castles accomplished, we decided to head into the city of Cork. The rush hour commute seemed to be happening again, it was about 4:20. We crossed a couple bridges and parked in the first car park we came to. It was the the city hall lot and they used the same ticketing and payment system as they do in my hometown of Silver Spring. We wandered around lost for about 20 minutes until we got our bearings, and headed to the city centre. We walked down the main row with all the shops and restaurants looking for hostels, but could not find any. So Andy decided to take charge. We went into the Old Oak bar, which he had heard of by reputation, and ordered drinks. The bartender gave us the scoop on the local hostels and recommended one called Brú, which also had a bar in it, and he even drew us a map. So, with one pint in each of us, we wandered over there and booked two beds in a four bed room. We went up and barrelled into the room not really knowing the hostel etiquette. Well, we didn’t barrel in because we couldn’t figure out the key quickly, and a woman opened the door for us. She was in there with another fellow. We checked out the room quickly and left in what I realized later was probably kind of a rude way. We walked back to the main drag and had dinner at a little second story restaurant called Adam + Eve. I had a very good braised salmon and Andy had lamb. I was very happy with the meal. We walked back to the car and found out it would cost less if we paid now, so we did. It was €13. It would have been only €5 if we had parked after 5 but c’est la vie. I got some of my stuff from the car but Andy opted out. We walked back across the two rivers to the hostel. We sat in the back of the bar for most of the evening; Andy drank a bit and I wrote in this chronicle. We saw our roommates in the bar but didn’t try to talk to them. Andy took a 20 minute break from the bar to lose €10 in the casino across the street. It was probably worth it, though, since he got some good information about the Cliffs of Moher from the Romanian dealer. We went upstairs, settled in, and the only time we talked to our roommates was when they told Andy where the bathroom light switch was. We slept well in the bunk beds. I had the top bunk just as I did when we were young.